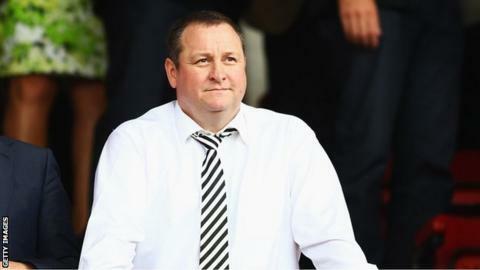 The Scottish Football Association has rejected Mike Ashley's request to raise his shareholding in Rangers International Football Club to 29.9%. The Newcastle United owner currently holds 8.92% and wanted to increase that in return for providing funding. Rangers need at least £8m of fresh investment to continue trading for the next 12 months. The SFA board "unanimously" declined Ashley's proposal, a decision which has left Rangers "very disappointed". The club intends to hold a share issue early in the new year, but a £16m proposal from a consortium including Dave King remains on offer. The SFA's Article 13 states that no individual can hold stakes in two clubs without prior written permission from the board. Ashley received that permission when he bought his initial shareholding, but he also signed up to an agreement not to own more than 10% and not to exercise undue influence on the boardroom. Following a £3m loan from Ashley to Rangers last October, the club has appointed Derek Llambias, a long-time Ashley ally, to the board. The former Newcastle United managing director is now the club's chief executive. Barry Leach, a Sports Direct executive, has also been appointed as a consultant and has been tipped for a role as finance director at Ibrox. The SFA has already issued Ashley and Rangers with notices of complaint based on potential breaches of the dual interest rules. A hearing has been set for 27 January. Ashley's request to raise his shareholding further was separate to this, and Llambias met with the SFA board on Tuesday, accompanied by Rangers Football Club chairman Sandy Easdale. The meeting considered a request to an "increase in MASH Holdings Limited's shareholding in Rangers International Football Club to a maximum of 29.9% of the issued share capital," said an SFA statement. It added: "The Board has now carefully considered the application and has decided, unanimously, that the application should not be granted. "The Board, under Article 13 of the Scottish FA Articles of Association, is required to have due regard to the need to promote and safeguard the interests and public profile of association football, its players, spectators and others involved with the game. This test is set out in full in Article 13.6." Had permission been granted, Ashley could have underwritten the share issue. The board can seek alternatives - and the King consortium's offer remains on the table - or try to raise the £8m from all of the existing shareholders. That is unlikely to suffice, though. Ashley could also simply loan the club more money, secured against the assets, or buy the shares and take the SFA's punishment, much of which, by necessity, would fall on the club itself. "The board of Rangers Football Club are very disappointed with the SFA's decision," read a club statement. "We will now consider all our options."